Surrounded by a graceful wraparound porch, this home boasts formal rooms at the front and a wonderfully open casual area at the back for family togetherness. The foyer, living room, and dining room welcome all into this gracious four bedroom farmhouse. The generous island kitchen and breakfast area with bay window are open to the spacious family room with fireplace and built-ins. 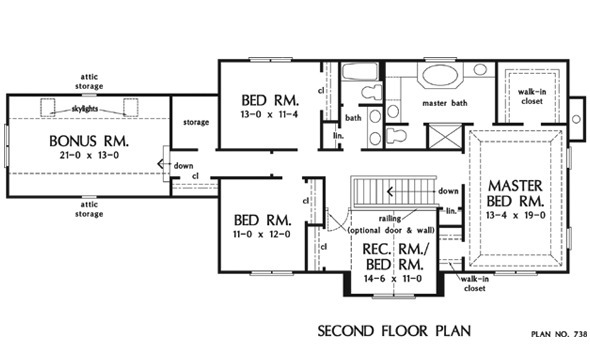 Upstairs, the master suite features a tray ceiling, two walk-in closets, and a marvelous master bath. The family bedrooms utilize a segmented hall bath with dual sinks and linen closet. The rec. room/bedroom offers an optional fourth wall or railing for added openness. Additional room and storage can be found in the bonus room. 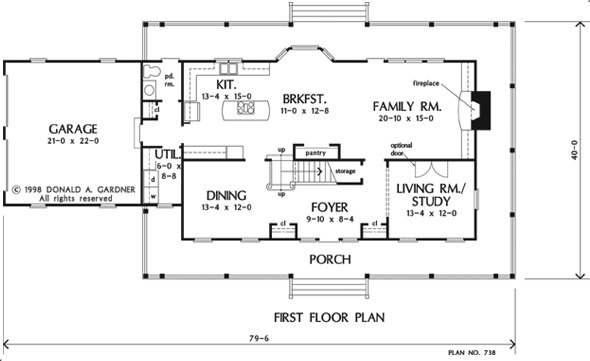 2nd Floor: 1258 Sq. 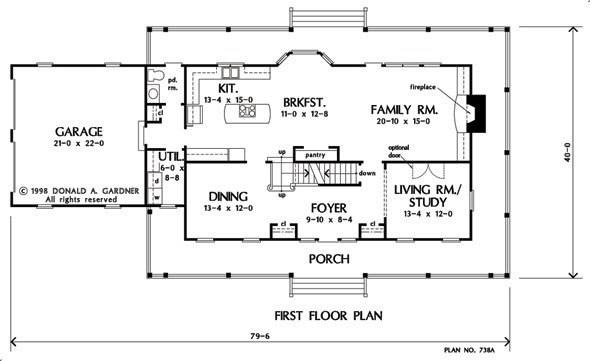 Ft.
House Dimensions: 79' 6" x 40' 0"
Great Room: 20' 10" x 15' 0"
Master Bedroom: 13' 4" x 19' 0"
Living Room : 13' 4" x 12' 0" x 9' 0"
Bedroom #2 : 13' 0" x 11' 4" x 8' 0"
Bedroom #3 : 11' 0" x 12' 0" x 8' 0"
Bedroom #4 (Cathedral): 14' 6" x 11' 0" x 13' 0"
Bonus Room (Vaulted): 21' 0" x 13' 0" x 8' 0"
Foyer : 9' 10" x 8' 4" x 9' 0"
Great Room : 20' 10" x 15' 0" x 9' 0"
Kitchen : 13' 4" x 15' 0" x 9' 0"
Master Bedroom (Tray): 13' 4" x 19' 0" x 8' 0"
Porch - Rear : 57' 10" x 6' 0" x 0' 0"
Porch - Front : 57' 10" x 6' 0" x 0' 0"
Porch - Right : 6' 0" x 28' 0" x 0' 0"
Storage (Bonus) : 6' 0" x 6' 10" x 0' 0"
Storage (Other) (Sloped): 8' 10" x 3' 4" x 0' 0"
Utility Room : 6' 0" x 8' 8" x 9' 0"